ST’s 8-bit microcontroller platform is implemented around a high-performance 8-bit core and a state-of-the-art set of peripherals. This platform is manufactured using an ST-proprietary 130 nm embedded non-volatile memory technology. 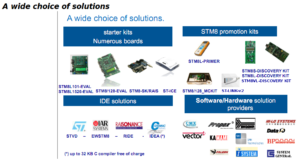 STM32-STM8 embedded software solutions (update to January 2012, pdf 1.9MB), is here. The nice thing is that the STM for STM8 family gives us the libraries in C to manage all the peripherals of STM8. 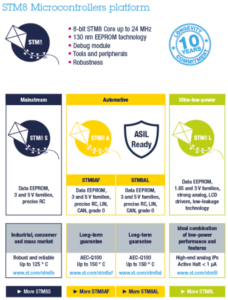 A complete list of the STM8 MCU Eval Boards, Discovery and Nucleo are here.